Since 2002, Pew Research Center has conducted more than 500,000 interviews with people in 64 countries to learn their views about international and domestic politics, economics and other front-burner topics. Our newly updated Global Indicators Database serves as an interactive repository of these findings. You can use the database to explore public opinion around the world on issues that interest you by country, region and subject area. 1 Views of the economy have rebounded in several large and economically powerful countries. 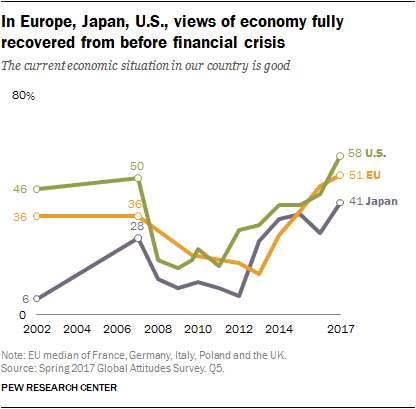 In 2009, during the Great Recession, just 10% of Japanese, 17% of Americans and 28% of Germans rated their country’s current economic situation as good. By 2017, these shares had increased by at least 30 percentage points in each country, including a 58-point jump in Germany, where 86% of the public now describes the nation’s economy as good. Favorable perceptions of the economy have also risen sharply in India, from 57% in 2013 (the earliest year for which data are available) to 83% today. In some other large countries, opinions have moved in the opposite direction. In Brazil, which has struggled with political and economic crises, just 15% of the public now rates the economy as good, down from 62% in 2010. 2Even in some places where views of economic conditions have improved, there is pessimism when it comes to the financial future of the next generation. About half of people (52%) in Germany, 58% of Americans and 72% of Japanese say that children today will grow up to be worse off financially than their parents were. Other countries where majorities hold this view include South Korea (55%), the United Kingdom (68%) and Australia, Canada and Spain (69% each). While views in countries with advanced economies tend to be pessimistic, opinions are more mixed in developing and emerging economies. Roughly three-quarters of people in India (76%) and Nigeria (72%) expect children today to be better off than their parents, as do 95% of people in Vietnam. On the other hand, after years of economic struggles, 51% of Venezuelans say children today will grow up to be worse off than their parents, up from just 21% in 2013. 3Views of NATO have ticked upward in many member countries. Opinions about the North Atlantic Treaty Organization have improved on both sides of the Atlantic over the past year. The share of the public with a favorable view of the alliance increased by 9 percentage points in the U.S. and 10 points in Canada, along with a rise of 7 points in the Netherlands, 8 points in Germany, 9 points in Poland and 11 points in France, where it had fallen 15 points between 2015 and 2016. At least six-in-ten people in each of these countries now have a favorable view of NATO. In the U.S., the recent uptick in approval has mainly been driven by Democrats, while Republican views have remained largely unchanged. 4Russia’s standing among Europeans has slipped. Views of Russia were at their most positive in several European countries in 2011, but they have fallen since then and have remained consistently low over the past few years. Between 2011 and this year, the share of people with a favorable opinion of Russia has declined by double digits in France, Germany, Poland, Spain and the UK. The biggest drop occurred in the UK, where just 26% of the public now sees Russia favorably, down from 50% in 2011. Today, no more than 36% of the public in any of these five countries holds a favorable view of Russia. 5 Globally, more people have confidence in Angela Merkel than in Xi Jinping, Vladimir Putin or Donald Trump. A global median of 42% across 37 countries has confidence in the German chancellor when it comes to world affairs, compared with 28% for China’s leader, 27% for Russia’s leader and 22% for the American president. Confidence in Merkel is especially high in Europe, where about nine-in-ten Dutch and Swedish people (89% each) and about eight-in-ten Germans (81%) and French (79%) trust the chancellor on the world stage. But Merkel also draws considerable confidence in South Korea (74%), Vietnam (72%), Australia (70%) and Japan (67%). 6International views of the U.S. have fluctuated over time, often accompanying changes in political leadership in Washington. In Western Europe, opinions about the U.S. grew much more positive after Barack Obama became president in 2009 but fell sharply following Trump’s inauguration in January. France is a prime example of Europe’s ups and downs. The share of the French public with a positive view of the U.S. rose from 42% to 75% after Obama replaced President George W. Bush in 2009, then fell from 63% to 46% after Trump succeeded Obama. Similar shifts occurred in Germany, Spain and the UK. That’s not to say that views in all countries have moved in the same direction. In Russia, the U.S. is seen considerably more favorably today than in the final years of Obama’s presidency (41% of Russians now have a favorable view of America, compared with 15% in 2015). 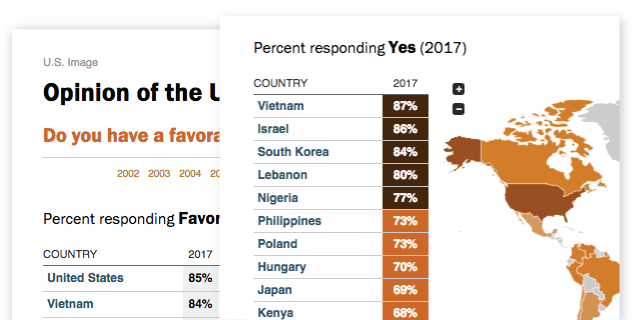 And other nations have remained largely positive (Israel) or negative (Jordan) in their views of the U.S, regardless of which administration is in power.